Uncharted: The Lost Legacy drops next week and for most people who own a PS4 it’s pretty much an essential buy. This is because most PS4 players are unabashed Uncharted fans as the series has been one of Sony’s most consistent performers both in terms of sales and critical reception, and its success quickly turned Nathan Drake into a gaming icon. We know there are some folk out there who’ve never played an Uncharted game – yes, it’s shocking but true. This could be down to the fact the PS4 is your first console or that you never had enough dough to splurge on an Uncharted game after picking up the titles you felt were essential before browsing others. Strangely, for a game that drops players into a plot that takes place after the series’ best known protagonist has left the building, Uncharted: The Lost Legacy is probably one of the best starting points for newbies. First up, it’s the cheapest of the bunch, as it’s being sold at ~$40/£30 a copy. Second, its mechanical depth is on a par with Uncharted 4 – and that’s arguably the deepest of the series. On top of that, while the campaign is relatively brief when compared with other iterations in this series, it’s a fantastic introduction to the series as it ticks all the boxes Uncharted fans have come to expect; the story and characters are well written, the action is rock solid and the set pieces are as near-the-knuckle as any other game in this franchise. That having been said, if Uncharted: The Lost Legacy is your first taste of this series, some of the plot points and characters may need a bit of background. Introduced in Uncharted 2, Chloe Frazer originally came across as being rather like Nathan Drake – a ne’er-do-well treasure hunter with a sharp tongue and a devil-may-care attitude. However, in The Lost Legacy, Naughty Dog reveals some hidden depths to this character that better explain her motivations and complexities. One of Nate's former lovers, in Uncharted 2 Chloe starts out working with him and his old pal, Sully, on another treasure-hunting adventure, but ends up being a bit of a double agent. It's a complicated business after all. By Uncharted 3, they've fixed some of their wounds but part ways after a series of events nearly kills Cutter, another member of Nate's extended crew. She’s the perfect foil for both Uncharted veterans and noobs; the latter know nothing about her and have everything to learn. Series experts will also be on the back foot too, thanks to her nebulous non-committal attitude in Uncharted 2 and 3. Imagine Lara Croft with a more ruthless streak and you’re starting to get the idea. One of the more interesting villains in videogames for the past few years, South African mercenary Nadine Ross was introduced in Uncharted 4 as the head of a paramilitary-for-hire force called Shoreline. In that game she was revealed to be as elegant and she was capably violent and her exit from the game – no spoilers here – showed she had something of a moral code, despite being employed by Uncharted 4’s main bad guy. That game gave her nowhere near enough screen time so it’s great that she makes a return here. The Uncharted series is basically the best set of movies you ever played. That’s not to say that you’ll be sitting looking at a load of cut scenes (although there are some you’ll be watching), but instead imagine yourself starring in your own Indiana Jones film. This means car chases, ancient ruins, puzzles involving archaeology and lots of fighting (both of the gun and fist variety). Oh, and expect several instances where you’ll be running for your life through a building as it collapses around you with death snapping at your heels. All good? Once Chloe and Nadine clear the initial stages in the city, they’ll enter a valley filled with temples, forts, rivers and the odd bridge. As the pair progress through the terrain, Chloe will note any landmarks on the map the player can access through the DualShock’s touchpad. Players only need to visit three locations – and it’ll soon become clear which three – in order to leave the valley, but it’s worth exploring every inch of it. Here’s why: roughly at the centre of the valley stands a large tower. If players venture to the top of it they’ll find a room, which has several large windows in it that are sealed off by shutters. Opening these shutters will reveal the locations needed to progress to the next stage of the adventure… and a temple set into the side of a hill. If players visit that, they’ll find what we affectionately refer to as The Monkey Temple – so-called because it has a bunch of grey monkeys hanging around in it. Here, players will find a quest that works with some of the trinkets they’ve been working with and a map to help them complete it. It’s not necessary to do any of this in order to finish the campaign, but for completionists, it’s a must. 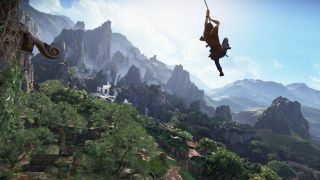 As was the case in Uncharted 4, players can use long grass and overgrowth to keep hidden from enemies, if they don’t fancy embroiling themselves in noisy gun battles. To that end, one of the more useful items is a silenced pistol Chloe will pick up in the valley. Given that cover makes Chloe invisible, players can dispatch enemies silently and return to cover and – provided Chloe isn’t caught in the act – they’re unlikely to be discovered. The big upside to this is that the stealthy approach can help players unlock several Trophies, including one that involves nailing 5 enemies without being seen and one requiring the destruction of a helicopter in a train yard filled with enemies – which once again, requires not being seen. Uncharted has always had pretty shonky grenades; toss one in the direction of a couple of enemies and they leg it – probably because of that annoying beeping sound – which makes one wonder what use they are to begin with. C4, on the other hand, is a different story. When C4 lands on a target it makes no sound and it arms pretty quickly. It can also be stacked for maximum destructive effect; toss three of these packets onto a vehicle for example, and you can blow the sucker up with one click of a detonator. It’s worth doing this in one particular instance, incidentally, because it can net you several Trophies, including Overkill (blowing up an APC with one detonation) and C-Phoria (blowing up 4 or more enemies with one blast). Remember, the bigger the stack, the bigger the explosion. The Uncharted games have always been filled with eye-wateringly beautiful vistas and The Lost Legacy is no exception. This time round, though, it’s worth players checking out the lush scenery because occasionally they’ll be prompted to snap a picture of it with Chloe’s phone. It’s worth listening to the back-and-forth between Nadine and Chloe and the best spots give clues about where these photo spots are – they have sentimental value to Chloe. On top of unlocking extras in the main menu, grabbing all of the photo spots in the game unlocks the ‘Pics Or It Didn’t Happen’ Trophy.